Perry accepts a thirty-eight-cent retainer from shapely Millie Crest, posing as Fern Driscoll, and played by the beautiful Ruta Lee. Unbeknownst to Perry, Millie has taken on this identity from the real Fern Driscoll (who is supposedly dead), to shield herself from a troubled past. 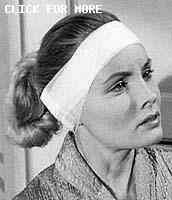 As Fern Driscoll, she runs into even bigger trouble when she stabs a man in self-defense, and goes on trial for murder. When Carl Davis turns up dead, from poisoning of a stab wound to his arm, a friendly witness points to Millie, now Fern. Sound Editor � Gene Eliot, M.P.S.E. CARS: 1957 Ford Fairlane Club Coupe 2dr hardtop, white; 1956 Buick Special Convertible, white, black top up. Cameo: 1956 Buick Century 4dr hardtop, dark color & white. From The Cars by Greg Cockerill. This episode of Perry Mason (TCOT Foot-Loose Doll) is based on an Erle Stanley Gardner novel of the same name. The season nine episode titled TCOT Fanciful Frail (#265, 9.24) is also based on this same ESG novel. So this ninth season episode is often considered to be a "re-make" of TCOT Foot-Loose Doll. See here. Submitted by Charles Richmond, 26 April 2013. The same setup shot is used for the Dr. Barnes Seaside Hospital as in #30, TCOT Screaming Woman. See here. Submitted by Charles Richmond, 6/2/2004. TCOT Rare Reporters. 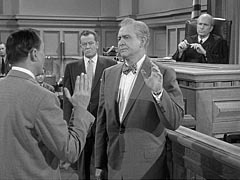 During the trial scene in which Senator Baylor (Barton MacLane) testifies, there are two very visible extras on Mason�s side in the front row who busily write in pocket-size notebooks, obviously portraying reporters. When Baylor drops the bombshell that he was the one stabbed by Mildred Crest, the two and another extra in the second row bolt from the courtroom to call in the story. Despite the many political and show business bigwigs involved in the Mason cases, this is the only instance I know of where this happens. Submitted by FredK, 1 Nov 2009. Sightings: During the hearing, sitting next to the Senator himself, is the Little Old Lady in a Hat. She can be first seen when Mr. Burger raises ad objection and then moments later when the courtroom gallery is all a-twitter after a shocking revelation. On the second day of the hearing, a different lady is sitting next to the Senator, but the Lady is across the aisle. Submitted by gracep, 8/13/2010. + The same Little Old Lady in a Hat can be seen for a split second exiting the Claymore Apartment Hotel, just as Perry enters. She wears the same hat in court later on. Submitted by Evelyne, 1/25/2011. ++ Joining our Little Old Lady in the courtroom gallery are Quiet Old Man #1, Distinguished Gentleman #2, and a somewhat hidden Distinguished Gentleman #1. Earlier �Miss Carmody� collects Miss Crest�s and Miss Richards� dirty dishes in the L.A. restaurant. Lastly, at the Seaside Hospital, the silent nurse is played by Distinguished Lady #1, who also turns up as a spectator when court reconvenes. Submitted by gracenote, 2/28/2011. +++ The Distinguished lady #4 sits next to the Senator at the second hearing. Submitted by BigBill767, 2/4/17. Uncredited Actors: In one shot, the courtroom spectator sitting behind Laura Richards (Eve McVeagh) is Don Anderson. In other shots of the courtroom that include Ms. McVeagh and more extras, there is a different actor in this seat. I can only guess that the director decided to add a reaction shot of McVeagh at some point and had to press a couple different extras into service to fill the area behind her. Submitted by FredK, 2 October 2010. Character Names: Millie Crest�s real first name is Mildred, which actually seems to be used more than Millie. Submitted by gracenote, 2/28/2011. + "Harriman" was also the 1st name of Admiral Nelson on Voyage To The Bottom of the Sea. Mike B. 6.15.16 MeTV airing. ++A minor correction, thanks to 21st century technology: W. Averell Harriman served in many political and diplomatic positions over an incredibly long career, including as Governor of New York. But he never served as a Senator, U.S. or otherwise. Submitted by BobH, 29 November 2018. Millie Crest is a very fortunate young lady. She is the driver of 1957 Ford that travels down a very steep hill, wrecking and catching on fire. Not only does she survive this disastrous wreck without a broken rib, cut, scratch, or bruise, but the automobile obligingly throws both of her suitcases out before it catches on fire so she will have clothes to change into. Submitted by PaulDrake33, 26 June 2008. + A Sign of the Times: Had Millie's accident occurred today with California's mandatory seat belt law, she probably would have been trapped in the burning vehicle and suffered the same horrible fate as "Fern Driscoll." Submitted by 65tosspowertrap, 5-21-2014. ++ Actually, she was VERY VERY lucky. In such an accident, unbelted, she would have been knocked unconscious well before the car ended at the bottom of the hill (think about how hard the interior surfaces of a '50's era car was - I remember my dad's '57 Fairlane) and been unable to get out, at least right away, on her own power. She also might have been killed by being thrown out of the car; moving at the same speed the car was, even a 30 mile an hour speed would have given her extremely bad injuries once she hit the ground, worse if it was rocky. The likelyhood that you'll be trapped in a seat belt is eclipsed by the certainty that bouncing around in a speeding car going out of control will kill you, or injure you VERY badly. Submitted by MikeReese, 9/25/2016. Laura's weekly income was "$85 Take Home." Mike B. + A little over $700 in 2017. OLEF641; 10/11/2017. Dr. Barnes Seaside Hospital is currently Cher�s house. No kidding! The Malibu estate has been on and off the market in 2008 at $41 million. As noted by Charles Richmond, the same location was featured at the beginning and mid-point of another episode, �TCOT Screaming Woman.� Posted by Eric Cooper, 19 November 2009. Cher's house update: Zillow says the $41M listing was removed in February 2010. Zillow estimates the current value at about $18M. Submitted by MikeM, 10/26/2012. What I Learned from this Episode: Don't pick up hitchhikers. Submitted by 65tosspowertrap, 5-21-2014. Submitted by 65tosspowertrap, 21 May 2014. Goof: TCOT Inconsistent Injury. Mason�s deduction about Baylor being the one wounded from the waving photo is an excellent decisive clue. However, someone in continuity should have reminded Barton MacLane about his injury in the earlier scene of Mason�s visit to his hotel. Despite being stabbed in the shoulder the night before, Baylor/MacLane uses his right hand quite freely, opening the door easily, gesturing expansively during the conversation and even reaching across his body, taking a cigar from his breast pocket and lighting it without any sign of injury. Submitted by FredK, 1 Nov 2009. Did the Senator actually lie? It was Burger who told the judge he had bursitis. The bigger shock is that he was willing that an innocent woman to be tried for murder. ++ It was Perry who gave Davis 30 minutes to decide about the doctor. OLEF641; 10/12/2017. The Case of the Phony Photo, Version 2.0 (See my comments regarding Episode #51 (TCOT Shattered Dream)): Another fishy photo in this episode, this time of Sen. Baylor "getting off an airplane" and waving. It's quite clear that two separate photos-- one of actor Barton MacLane (in the foreground) and the other of the plane (in the background)--have been clumsily melded into one. Submitted by BobH, 15 June 2016. + In the next scene the paper that Perry and Della are looking at has the picture without the photo of the senator pasted on. Also you'll notice the word "CAMPAIGN" is in a different font than the other words in the headline. It looks to be cut out and pasted over another word. Kilo 1/13/2019. Alaska became the 49th State the same month & year F-LD premiered: January 1959. Senators appear from time to time on Perry; the title derives from a Latin term for "Old Man": the Framers modeled the US Senate on the Ancient Roman Senate (Art. 1, Sec. 3). Mike B. 6.15.16.